One of the greatest strengths of the social justice movement is that we respect each others’ perspectives and value the continued process of learning from our peers. Too often, though, we communicate in silos, failing to convey a shared narrative that can move hearts and minds, and drive lasting policy and culture change. 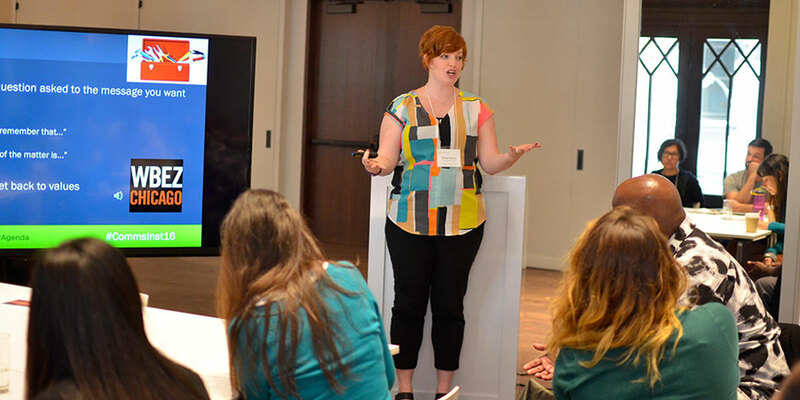 The Opportunity Agenda helps bridge that gap through intensive, interactive communications trainings that include skill and capacity-building workshops, panels, and webinars that have reached thousands of leading advocates and activists. To actually step back and think about how my messaging can be more effective, it’s been a very powerful and very rewarding experience. Our trainings strengthen partners’ capacity on key topics like narrative building, messaging and framing, media interviews, social media, and cultural strategies. Our trainings include in-depth opportunities like our annual week-long Communications Institute, through which 15-18 Fellows working on related issues come together for dynamic activities like televised mock interviews, talk radio exercises, and public speaking practice. We also provide shorter field trainings, often as an element of partners’ larger convenings. Authenticity: We know effective stories are the ones that matter to the teller. We help identify which personal stories from advocates and their communities will have the greatest influence, and understand how the story can be presented to maximize impact on key audiences. By tailoring trainings to the needs of partners, and offering practical activities like mock television interviews, we help trainees show their most compelling face to the world. Action: We design trainings for for active communicators and social justice leaders who are ready to get into the media today. We teach techniques with a deep grounding in research and best practice that can be put into play immediately. Whenever possible, we pair trainings with practical communications tools and media placement to not only shape the public narrative but also let participants put new skills into practice. Aspiration: We help communicators offer a vision of the world as they believe it should and can be, and we challenge them to take an intersectional approach that builds a stronger and more vibrant social justice sector. These trainings aren’t just about winning an argument, they aim to build movements and secure lasting and transformative culture and policy change. You all gave us such hope and guidance about how you get something accomplished. We track the impact of our trainings on participants as well as on the public narrative, and the impact is astounding. Our trained partners have secured coverage in national newspapers, wire services, radio, and television networks, including USA Today, The Wall Street Journal, The Associated Press, CNN, NBC, and NPR; high-circulation regional papers, including The Washington Post, Los Angeles Times, and San Francisco Chronicle; targeted publications like Ebony and The Hill; Spanish-language media including La Opinion, Univision, and Telemundo; progressive web outlets like ThinkProgress, BuzzFeed, and The Huffington Post; as well as myriad local newspapers and broadcast stations.